Paper Therapy: My Favorite Things–December New Product Launch & Release Class! My Favorite Things–December New Product Launch & Release Class! The time has finally arrived – the December Release is live!! Yay!! I created a slider card project both for the New Product Launch and the December Release Class that features the new Our Town Die-Namics, the Open Road Die-Namics, and the Town Bear Stamp Set and coordinating dies! For all of the PDF instrutions for my project and the other December Release Class projects, as well as a step-by-step video for each project, please click HERE. 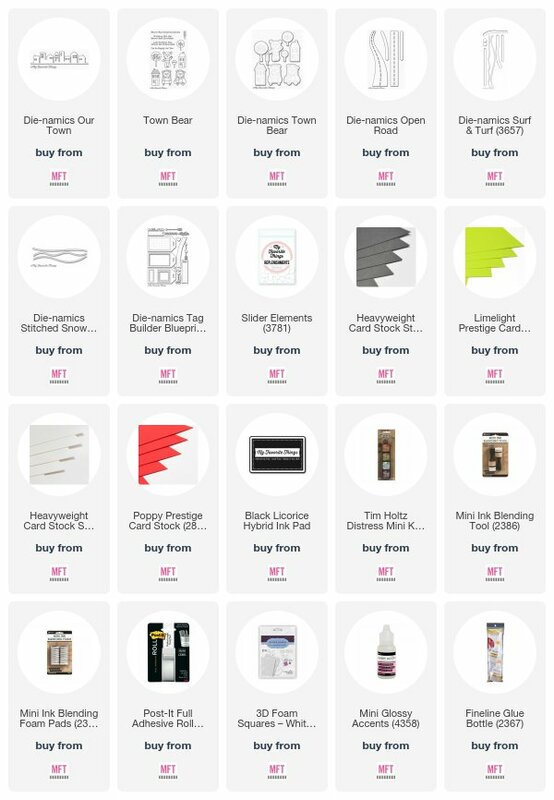 I’ve listed and linked all of the products that I used below. ALL of the December Release products are available now and can be purchased from the My Favorite Things Online Boutique by clicking on the graphic below. 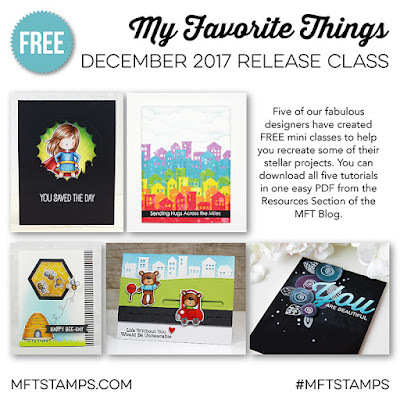 Please click on through to the MFT Design Blog to be linked to the other creative team projects using the December Release products!! And while you’re there, be sure and leave some love along the way for your chance to win one of TWO $100 Gift Vouchers from My Favorite Things! Woohoo!! That’s it for me today, friends!! Thanks so much for stopping by my little ol’ blog today!! It’s the best feeling for me to know that you all are willing to spend a little bit of your day here with me. I’m so grateful for that! I’ll be back again soon with more crafty goodness, so please come back again! Have a great day! Very cute and sweet scene. Love the little bears. Great slider card! I love the entire scene! A slider card. What fun! Can't wait to try it with the free class instructions. Darling card! Love those bears! Excited to see how you created this lovely card on the December Release Class - thanks so much! Super cute card; love the slider! The bears look so cute with the Our Town dies! Slider part of card is a nice touch. Oh my goodness what a cute card!!! Love those bears! I love your interactive cards. And such a cute scene. So cute! Love the sliding car. Super cute. I love the interactive cards a lot. Off to see the tutorial. What a perfectly adorable little scene! So cute... perfect card for the little ones to play with! Oh, what an adorable slider! Super cute interactive card!Thank you for the inspiration! Adorable bears and a well done scene. Oh that's too cute! It makes the heart happy! I love interactive cards and this one is just darling. It's nice to have the step by step for how it was done. Such a fun idea for the card. These bears are so cute! And I just love interactive cards, great job! So cute! I love those little bears!! Great little scene. Love the colouring of the bears. Thanks for sharing. That is too cute. Can’t resist an interactive card. So adorable and thanks to your wonderful instructions, I might be able to make my own now! Thank you! These bears are adorable! Such a crisp card. Adorable. I do have some slider dies but really need to use them more. Adorable interactive scene with these cute bears. What a sweet interactive card! Such a fun slider card! I love an interactive card! This is really cute. This one made me smile, I love that little bear and how you have him riding down the road! Love the sliding bear card.